#57. Wasatch Range from Salt Lake City. 18 x 36, oil on canvas, relined. "Gilbert Munger" lower left. Very similar o painting #221. (See the discussion of the Wasatch paintings here for more details.) Sold by Bourne, Hyannis MA, at 22 Oct 1976 auction as "View of Grand Lake and Long's Peak, Colorado", lot 95 for $2,000 + premium. From the Anschutz Collection, Denver, in 1998 to the Dan & Sue Berman Collection, Salt Lake City. IAP 87440011. 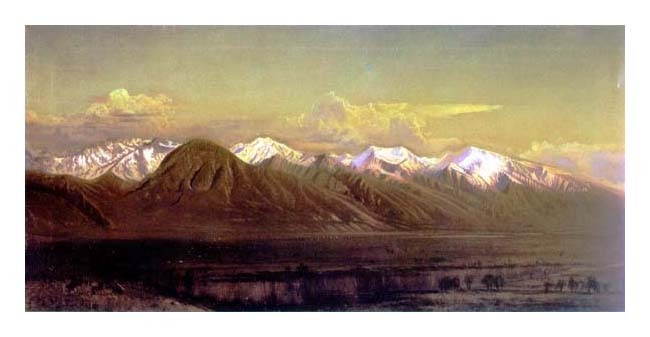 See The Rocky Mountains: a Vision for Artists in the 19th Century by Trenton and Hassrick, Univ. of Oklahoma Press, 1983, pl. 21, p. 188. In "A Personal View of the American West: Canvases from the Collection of Dan and Susan Berman", Utah Museum of Fine Arts, Univ. of Utah, 26 Mar - 8 Aug 1999. Image from Rocky Mountains plate.